"The fact that since 1986 Mike Fuljenz has won so many major awards in so many diverse categories, including the NLG top award 'The Clemy,' underscores how important his peers in the rare coin and precious metals markets view Mike's excellent analysis and reporting." "The Congressional Medal of Honor Foundation salutes Mike Fuljenz for all he does to support our men and women in uniform who defend our freedoms." "Count me among Mike Fuljenz's numerous admirers. His strong leadership, input and support of the American Numismatic Association were instrumental in formulating ANA's coin grading and authentication policies, which is a testament to his commitment to the industry. He is a leader in the coin industry." "Mike Fuljenz has been a member in good standing of the American Numismatic Association (ANA) since 1980. Mike has taught seminars for ANA almost every year since 1982 on advanced coin grading, detection of counterfeit coins, and our "super course" on gold, silver and commemorative coins…He is simply a terrific teacher." When I used to teach school, I knew I could capture the attention of young children by drawing three intersecting circles. 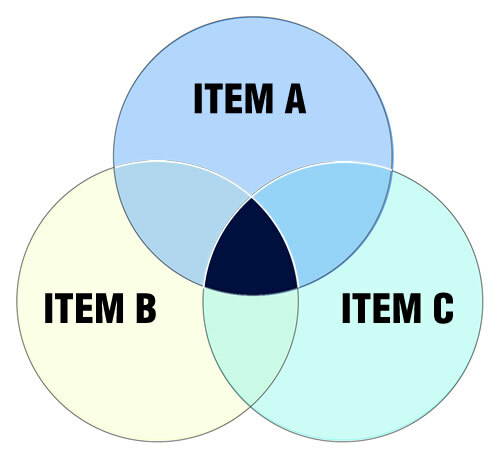 Even today, when speaking with adults, the same lesson works, only adults like to call them “Venn Diagrams.” In the case of rare coins, you can use three intersecting circles to represent the intersecting interests of the coin collector, the coin investor and the coin market vender, or the intersecting circle of demand between bullion coins, rare coins and the cross-over semi-numismatic coins. For instance, we like to compare the markets for coins like the Type II and III $20 Liberty Double Eagles and the $2-1/2 Indian Head Quarter Eagles. These markets have as many different collector and investor groups needing them in the future creating multiple streams of demand. We use intersecting circles of different sizes to represent growing or waning collector or investor interest in particular coins that we select for our clients. By looking at collector markets this way, we are better able to advise our customers about potential rising or falling coin prices on coins they need to complete their collections. And circles look a lot like coins, don’t they? Call an account representative today to learn about the best values available in the market today. It’s interesting to note the similarities between October 2016 and October 2018. Back in October 2016, the stock market (S&P 500) fell 4.2% in the five weeks leading up to the election, on the presumption that Hillary Clinton would win, then it took off like a rocket when Donald Trump won. There is a likelihood that October’s stock market slump is due to an expectation of what might happen if the Democrats take over the House. Likewise, the stock market might recover if Republicans score a surprise win next week. In a mirror image to stocks, gold rose in October 2016 (as it has done in October 2018) from $1,254 on October 6 to $1,303 on November 4, the Friday before the election, but then gold fell sharply to $1,125 in mid-December, after Donald Trump won. From this track record, it is possible that gold could fall next week if the Republicans score a surprise victory and retain control of the House of Representatives. However, in the greater likelihood that the Democrats win control of the House, gold should continue to rise and stocks are likely to fall, as it sinks in how the virulently anti-Trump Democratic House will seek to discredit and perhaps impeach the President and, at the very least, stop his winning streak of legislative programs promoting prosperity, including tax cuts, deregulation, and pro-growth bills. This could slow down today’s rapidly growing economy. Although this will likely help gold and rare gold coins, it will not be healthy for the nation at large. Next week we will publish this report after the Tuesday election. We will include information on what the markets have done after some previous elections and what that could foretell for precious metals and rare coins. The harshest bear markets in stocks have often led to bull markets for rare gold coins. If you believe the Democrats could regain control of the House of Representatives, I believe now could be the right time for you to buy more select gold coins. Please discuss this important opportunity with your account representative before the election! Since World War II, the first mid-term elections after a new President has been elected have found the party opposing the new President gaining an average 26 seats in the House of Representatives. If the President has a popularity rating less than 50% the average since 1945 is a gain of 37 seats. Back in 1994, there was a “Republican Revolution” in the first mid-term election of the Clinton era, after Hillary Clinton’s flirtation with “socialized healthcare” had angered many voters. Republicans, led by Newt Gingrich and his “contract with America,” stormed to victory with a 54-seat swing, taking control of the House for the first time in 40 years (since 1954), by a healthy margin of 230 seats to 204, thereby throttling the Clintons’ most aggressive liberal programs and leading toward greater prosperity, capital gains tax cuts, “the end of welfare as we know it,” and balanced federal budgets by the end of the decade. Something like that may happen this year, according to the pundits at “538.com,” the Website that takes its name from the number of electors in the Electoral College. They follow each of the 435 House districts and 100 Senate races in granular detail and add up the details in real time. Their latest totals show an 85% chance that the House will go Democrat, with a median 40-seat gain for the Democrats. More comforting to Republicans, “538.com” sees an 82% chance for the Republicans maintaining control of the Senate. It’s also comforting to the Republicans that in their last poll on November 8, 2016, “538.com” predicted a 71.4% chance that Hillary Clinton would defeat Donald Trump for President, so their polls can be flawed. The next time someone tells you that your idea or thought is “for the birds,” don’t take it so negatively. You might be surprised to find out how special our feathered friends really are. In fact, I wish that people were more like certain fowls—especially geese. Fact number one is the reason that geese fly in a “V” formation. You see, as each goose flaps its wings, it actually creates 70% greater flying range than if each flew alone. Wow! What would happen if people worked together in unity? They would “uplift” each other, that’s what! The second fact tells us that when a goose, for whatever reason, falls out of formation, it immediately feels the drag and resistance of flying solo. This makes its job extremely more difficult, and being the wise bird it is, it immediately falls back into the formation to take advantage of the “uplift” created by the rest of the group. Wouldn’t it be wonderful if there was something that let us know when we were falling by the wayside and away from our team and our goals? In an extremely fascinating find, the third fact tells us that when the lead goose begins to tire, it rotates to the back of the formation, while another goose takes the lead position and responsibility of guiding the formation. Often times, failure in a business, family or any organization comes from people not taking their share of the responsibility. The geese take turns at pulling their own weight, we should too. If you ever have the opportunity to witness geese, you no doubt have heard the famous “honking” noise that they make while in flight. The fourth fact tells us that the honking noise is to encourage the geese in front to keep going. Teams that win championships, businesses that flourish, families that share complete happiness—they all understand the importance of supporting each other through encouragement. And the final fact—when a goose gets sick, geese drop out of the formation and follow it down to help and protect it. They stay with it until it dies or is able to fly again. Then, they launch out with another formation or catch up with the flock. In our society today, the most endangered species of all is loyalty. It especially shows up in times of adversity. What great creatures those geese are!! Important Disclosure Notification: All statements, opinions, pricing, and ideas herein are believed to be reliable, truthful and accurate to the best of the Publisher's knowledge at this time. They are not guaranteed in any way by anybody and are subject to change over time. The Publisher disclaims and is not liable for any claims or losses which may be incurred by third parties while relying on information published herein. Individuals should not look at this publication as giving finance or investment advice or information for their individual suitability. All readers are advised to independently verify all representations made herein or by its representatives for your individual suitability before making your investment or collecting decisions. Arbitration: This company strives to handle customer complaint issues directly with customer in an expeditious manner. In the event an amicable resolution cannot be reached, you agree to accept binding arbitration. Any dispute, controversy, claim or disagreement arising out of or relating to transactions between you and this company shall be resolved by binding arbitration pursuant to the Federal Arbitration Act and conducted in Beaumont, Jefferson County, Texas. It is understood that the parties waive any right to a jury trial. Judgment upon the award rendered by the Arbitrator may be entered in any court having jurisdiction thereof. Reproduction or quotation of this newsletter is prohibited without written permission of the Publisher.